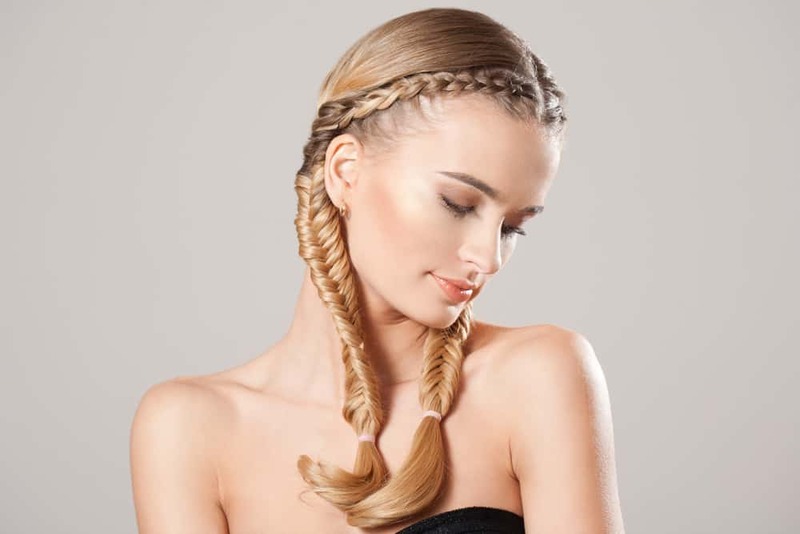 Going through the rigamarole of dutch braids isn’t something you do every day, but once in a while it’s fun to change things up and go for the “WOW” factor with your hair. We put together a terrific collection of real life examples of women with dutch braided hair. Check them out below. A magical unicorn hairstyle incorporated with dutch and fishtail braids in different approaches. Coloring your hair makes it dull and dry, but this one looks healthy and extra shiny, thanks to essential and natural oils for the proper hair maintenance. Chunky, twin dutch braids on long, golden blonde hair. This hair is kinda common on millennials but it does look gorgeous! Long, blonde hair in a style consisting of different braid types. The upper half of the hair is arranged into a five-stranded dutch braid while the lower half is styled into a neat fishtail braid. A black bow is then placed in the intersection to finish the look. Long, gray hair separated into two sections. Each section is arranged into a reverse dutch braid; from the lower portion of the head and up to the top, creating a bow out of the remaining strands. A brunette with long hair, arranged into two separate dutch braids and then finally combined to create a chunky low bun. This one, looking cute and charming as it can be, evokes a youthful and positive aura. The singer showcased her charming and trendy side with this braided hairstyle incorporated with gold embellishments and clips. The talented singer spent Summer 2015 in her most stylish way. She wore a braided headband that went all the way down her shoulders as a chunky three-strand braid. This hairstyle is composed of two dutch braids and two buns, because why not? The finish looks really sasy and cute perfect for tumblr girls out there. Long and wispy, blonde in a messy but unique hairstyle. Front section of the hair is pulled-back into this huge and loose dutch braid then turned it into a messy knot. Those with highlighted hair always win the braided look! This brunette had her hair styled with a tight, dutch braid that looks more attractive thanks to some golden blonde streaks. This woman with long and straight hair is ready for her yoga! Her hair is styled in a neat, double dutch braids that will make fitness time worthwhile. Retro grunge meets shimmer. This turquoise-colored hair is arranged into two dutch braids turned into low buns. Hair glitters are then added to the roots of the hair to achieve the outer space vibe. Straight and long hair, dyed with a crisp, platinum blonde shade and arranged into this beautiful plaits. The finish is a combination of three dutch braids that intersects down the tip. Feel the Bohemian spirit with this braided half-up hairdo, accessorized with Boho hair embellishments to complete the vibe. A unique updo consisting of several braids arranged in cross-sections. This one looks like a hairdo from the medieval times. This jaw-dropping hairdo, composed of several types of braids, looks good both on a Boho-inspired outfit or a casual maxi dress. One perfect winter look for women with long, curly , blonde hair is this Game of Thrones-inspired hair do compose of double half-up braids and a tousled finish. Long, platinum blonde hair styled in a sleek and chic hairdo. A small section of the front hair is arranged into this gorgeous dutch braid, gradually joining all the remaining hair into a classic ponytail. This one is a nice stay-at-home hairstyle for blondes! It is consist of a loosely-done dutch braid and a flat bun, looking messy but sassy! The popularity of this style of braid capped in 2016 and then dropped a bit. It’s still relatively popular but goes up and down. Check out the trend chart.